Get Ready to Fight Some Runelords! The Return of the Runelords Player's Guide is here! Within, you'll find all the information you'll need to craft your character for this Adventure Path, including several unique campaign traits that will help tailor your character to the themes found in the campaign and... just maybe... set up some surprises for you along the way. 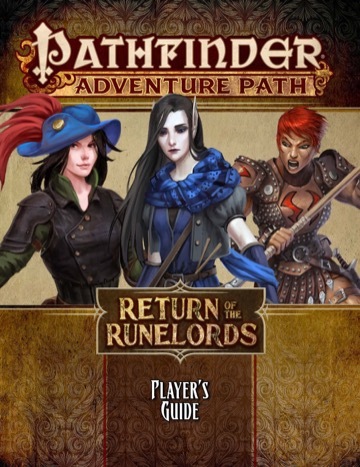 In addition, the Player's Guide helps you choose which of your prior PCs, if any, who took part in Rise of the Runelords or Shattered Star might have roles to play in the background of the Return of the Runelords Adventure Path. This new campaign begins in the small town of Roderic's Cove, and at the end of the Player's Guide you'll find a little chart that each of you will get to roll on at the start of the adventure, to determine what sort of bargains you might have uncovered at the town's weekly Circle Market. And never fear, if you find something you can't quite afford at the start, chances are good your bargain will still be for sale later in the week, once you've started to make your names as adventurers and have a bit more coin to your names. Certainly nothing bad will happen at the Circle Market, right? While the first adventure, Secrets of Roderic's Cove, takes place in the town itself, note that Return of the Runelords does not stay here—you won't be returning to Roderic's Cove during the course of the campaign in a significant way, so make sure your characters are both ready to defend the town but also eager to move on to explore the world. Your GM has additional information about Roderic's Cove, as presented in Pathfinder Adventure Path #133—but everyone might find the map attached to this blog post helpful in exploring. Have fun, and don't let those mean old runelords get you! Finally! Now the fun begins! Browsing it now - and the new approach to campaign traits is intriguing! You made the best trap ever into a campaign trait? Bless you guys. I've been planning on this being a campaign trait for this AP ever since I built that trap during development in the first place. It's fun to actually finally see it in print! How would you adapt this for 2E if you wanted to use the information in it. Ha! I think it would be great to have (or be) a GM who approves the Accidental Clone trait for the entire party! That is a fun one. That would make for a very awkward meeting with the original herself. On another note, Redeemed Nocty!!! Makes me so happy! I looked at her domains granted and my first thought was "Mid-2000's goth" and giggled. Now the question is, who is the new Queen of the Succubi(Not Sorshen??? ), and is there any meaning behind a seven pointed star crown in her symbol? Nocticula, patron deity of Sorshen's New Thassilon??? She should still be Chaotic, but might tell where she came from as a mortal. Might allow for someone who figuratively, and almost literally, follow Sorshen's footsteps. there is also a few cases of mixing "Rise" and "Return". Best campaign traits Ever! Even ignoring the first one! The campaign traits alone make me want to play this AP. It absolutely warms my soul to see how excited you are about this adventure. It just fills my heart with excitement and appreciation for everybody's hard work into this project! I can't wait for my group to finally run through this adventure! According to the Directorsaur over in the product thread itself, it's once per book. Anyway, yes. "Once per adventure" means "Once per book." I love all these callbacks, references, set ups for the future, reveals of the story... I greatly appreciate this building on the rich history and story for Varisia and Golarion as a whole. My group has only played Rise of the Runelords but man I'm excited to run this path. Maybe we can do an expedited Shattered Star somehow. A week of vacation during the holidays to power through? I wish I could spend a week of vacation powering through an AP . . . .